So, I currently have the evidence of a baking failure (or "baking fail," as the kids these days like to say) sitting on my counter. Obviously, I'm not thrilled. 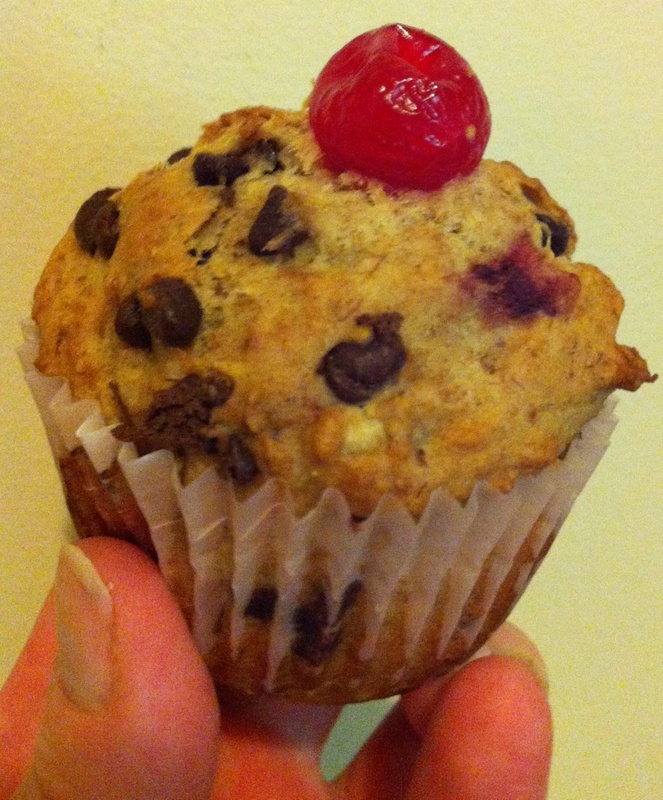 But I want to learn from this mistake and figure out how to make this recipe for banana split muffins work. First, I'm going to give you the (failed) recipe, which was based on my research, experience and preferences, plus feedback from my friend Lisa, whose recent Facebook post about making similar muffins (but flying by the seat of her pants, so she didn't really have a recipe to share) got me obsessed with the idea. Then, I'm going to tell you what I didn't like about how the muffins turned out. And, finally, I'm going to brainstorm some possible fixes and ask for your feedback on the ideas. So, first ... the recipe. It goes without saying that YOU SHOULD NOT USE THIS RECIPE. It didn't work. That's why we're here. • Preheat oven to 400F. • Line muffin tin with paper liners. • In a large bowl, mix bananas, oil, agave, soy milk, vanilla, almond paste and pineapple; set aside. • Sift together flours, baking powder, salt and baking soda. 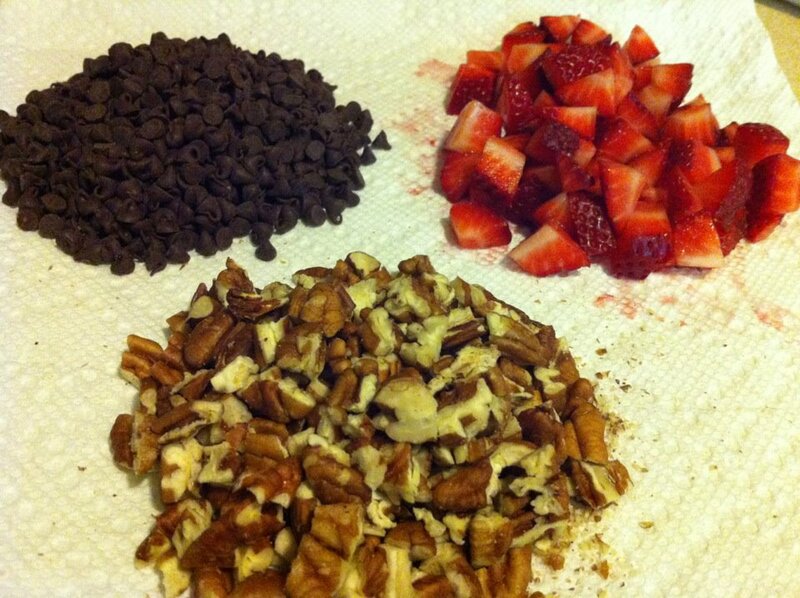 • Fold in strawberries, pecans and chocolate chips. • Fill paper liners with batter. Press a cherry into the top of each one. • Bake for 22-24 minutes (until the tops begin to brown). • Batter was too much like cookie dough -- needed to be looser. • Related: Muffins were too dense. • Not enough banana flavor. • Related: Too much flour flavor. • Not *quite* sweet enough. • Bottom of muffins stuck to paper liners. • Perhaps too much vanilla flavor. - Perhaps add more oil? And/or maybe use a different kind of oil altogether? - Use three bananas instead of two? Might that also help with the texture/density of the batter? - Use 3/8 or 1/2 cup agave instead of 1/4 cup? - Adding the full can of crushed pineapple may help with sweetness as well, so adding more agave may not be necessary if more pineapple is added. - Might fixing the batter problem also fix this problem? - Reduce vanilla to maybe 1/2 to 3/4 Tbsp. ?